ATM90E26 Single-Phase Energy Metering Demo Board is used for the demo and testing of ATM90E26 (single-phase energy metering AFE chip), which can sample single-phase voltage and current, meter active/reactive energy and output active/reactive energy pulses accordingly, as well as measure parameters such as voltage, current and power. 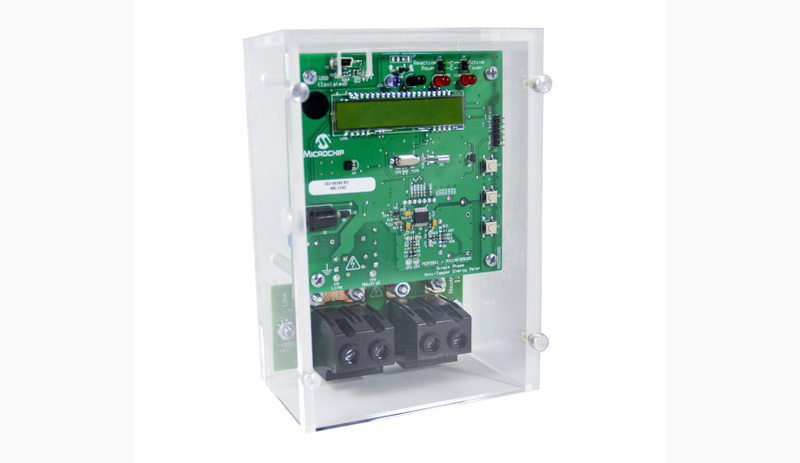 The AFE Control Board - SAM4C communicates with and controls the AFE board, providing easy access to evaluate the energy metering chips. ATM90E32AS Poly-Phase Energy Metering Demo is used for the demo and testing of ATM90E32AS (poly-phase energy metering AFE chip), which can sample poly-phase voltage and current, meter active/reactive/apparent/fundamental/harmonic energy and output these energy pulses accordingly, as well as measure parameters such as voltage, current and power. ATM90E36A Poly-Phase Energy Metering Demo is used for the demo and testing of ATM90E36A (poly-phase energy metering AFE chip), which can sample poly-phase voltage and current, meter active/reactive/apparent/fundamental/harmonic energy and output these energy pulses accordingly, as well as measure parameters such as voltage, current and power. 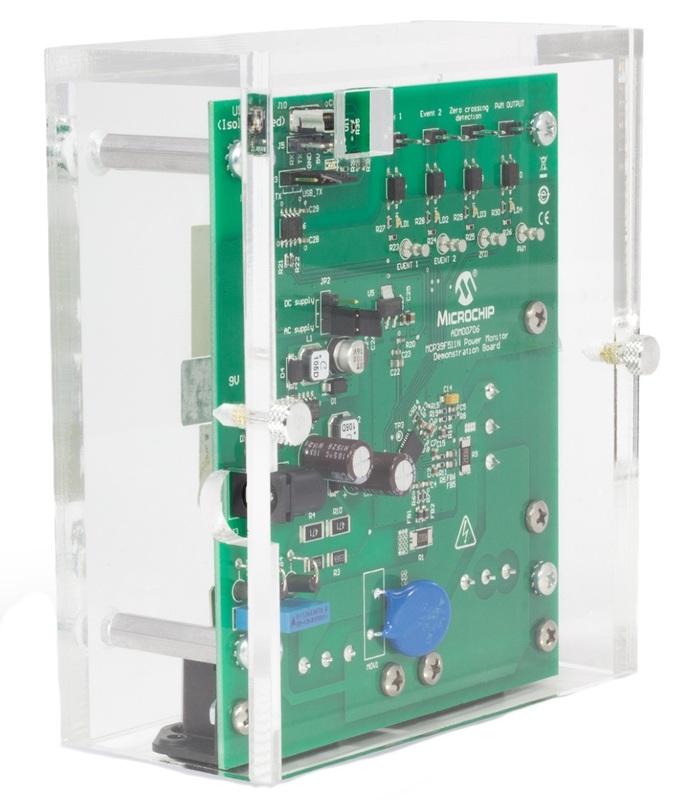 The SAM4CMP-DB Demonstration Kit uses SAM4CMP16 to demonstrate the high accuracy poly-phase energy metering functions. The SAM4CMP16 is an integrated poly-phase Energy Metering SoC with 100MHz, dual-core Cortex-M4 ARM processor cores. The board is ETSI format compliant and is designed to interface with CT, Rogowski and Shunt current sensors. The board can interface with ZigBee and PLC communication modules from . The demonstration kit includes a metering demo application and Metrology library for quick out of box evaluation. The users are required to connect their own current sensors to complete the metering demo setup. 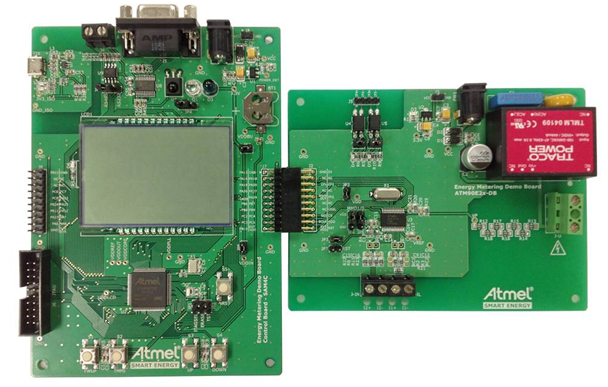 The ATSAM4CMP32-DB demonstration board uses ATSAM4CMP32C to demonstrate the high accuracy poly-phase energy metering functions. The ATSAM4CMP32C is an integrated poly-phase Energy Metering SoC with 120MHz, dual-core Cortex-M4 ARM processor cores. The board is ETSI format compliant and is designed to interface with CT, Rogowski and Shunt current sensors. The board can interface with ZigBee and PLC communication modules from . Contact your local sales representative for availability. 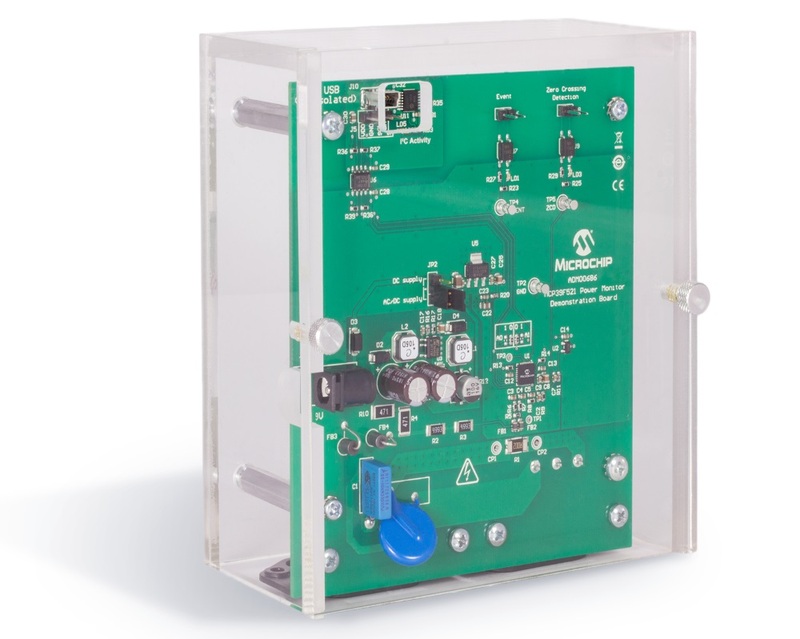 The SAM4CMS-DB Demonstration Kit uses SAM4CMS16 to demonstrate the high accuracy single-phase energy metering functions. The SAM4CMS16 is an integrated single-phase Energy Metering SoC with 100MHz, dual-core Cortex-M4 ARM processor cores. The board is ETSI format compliant and is designed to interface with CT, Rogowski and Shunt current sensors. The board can interface with ZigBee and PLC communication modules from . 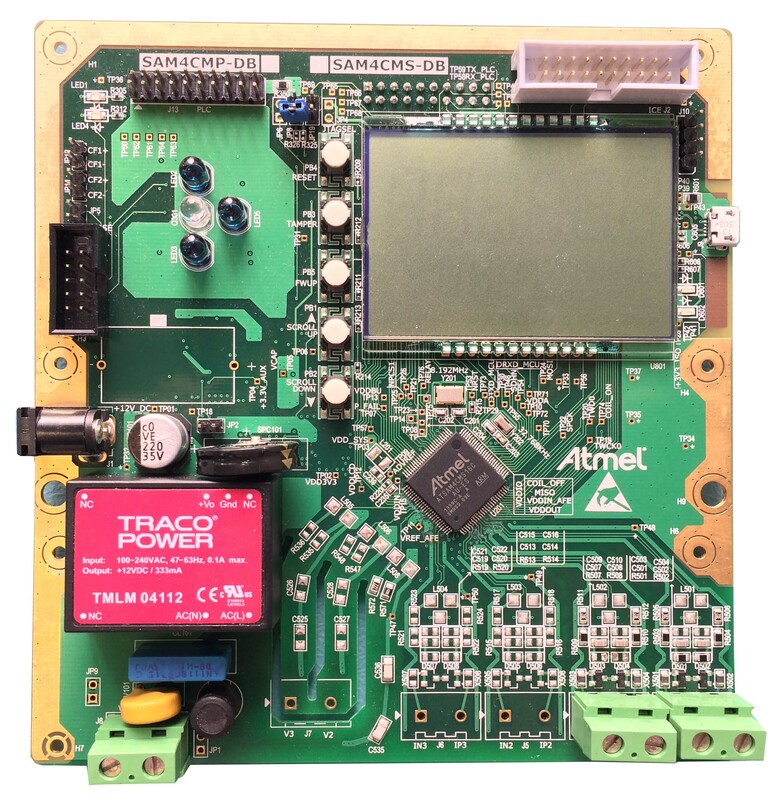 The ATSAM4CMS32-DB demonstration board uses ATSAM4CMS32 to demonstrate the high accuracy single-phase energy metering functions. 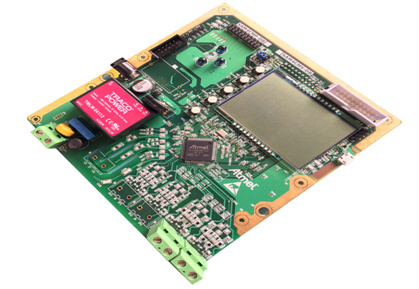 The ATSAM4CMS32 is an integrated single-phase Energy Metering SoC with 100MHz, dual-core Cortex-M4 ARM processor cores. 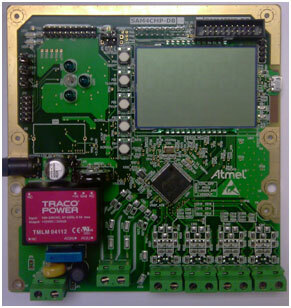 The board is ETSI format compliant and is designed to interface with CT, Rogowski and Shunt current sensors. The board can interface with ZigBee and PLC communication modules from . 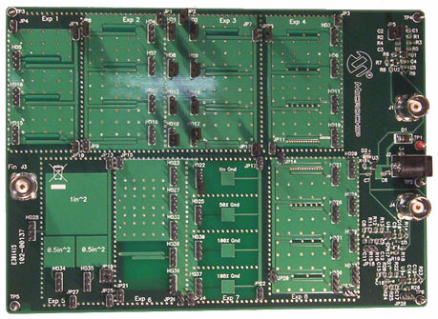 The E-Field Evaluation Board (EFIELDEV) is designed to demonstrate E-field coupling under various conditions on a Printed Circuit Board (PCB). These experiments will help system designers understand the impact PCB layout techniques have on controlling E-field noise in their design. The E-Field Evaluation Board PCB supports measurement of capacitive trace-trace coupling, in 1-layer, 2-layer, and 3-layer experiments; in each experiment, Transmitter-to-Receiver PCB trace spacings are varied, to demonstrate how coupling changes with distance. The 2-layer and 3-layer experiments use 1-plane and 2-planes of shielding to further reduce coupling. Additional measurements demonstrate fringing (non-line-of-sight) and via density effects. Limited by Gain Bandwidth of the on-board Operational Amplifier buffer/amplifier [needs external 9V] with Gain=1 or 10, experiments are run with frequencies from 10 kHz to 10 MHz from a Function Generator, amplitude measured using an oscilloscope; this range of frequencies illustrates how capacitive coupling is not dependent on frequency. The PCB has eight experiments, with up to 8 different Transmit-Receive trace-to-trace setups. 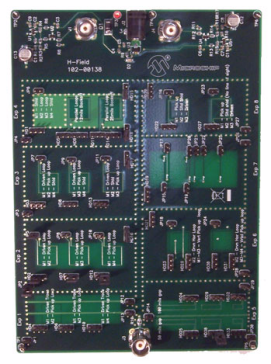 The Magnetic Field Evaluation Board (104-00138) is designed to demonstrate H-field coupling under various conditions. These experiments will help system designers understand the impact PCB layout techniques have on controlling magnetic coupling in their design. The Magnetic Field Evaluation Board supports measurement of inductive (magnetic) trace-to-loop and loop-to-loop coupling, with and without shielding by planes. Some experiments examine strong horizontal between layer loop-to-loop coupling, where shielding effects are easily demonstrated. Other experiments examine typical PCB trace configurations, where loop areas are much smaller and effects of distance are easily demonstrated. Limited by Gain Bandwidth of the on-board common-base Gain=100 signal booster [needs 9V], experiments are run from 1 kHz to 10 MHz, to demonstrate how inductive coupling is dependent on frequency. With 5V AC input [yielding 0.1 amp peak-to-peak into 50 ohm load], amplifier output amplitudes are .002V to 2 volts. 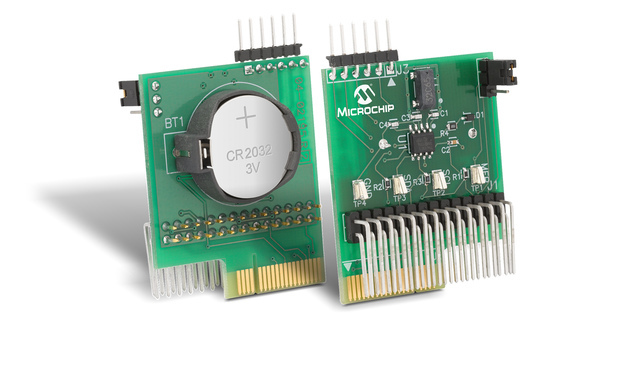 The MCP3910 ADC Evaluation Board for 16-Bit MCUs provides the opportunity to evaluate the performance of the MCP3910 dual-channel ADCs in a multiple device, isolated system. It comes with four MCP3910s, three of which are isolated and operate in 2-wire Serial Interface Mode. 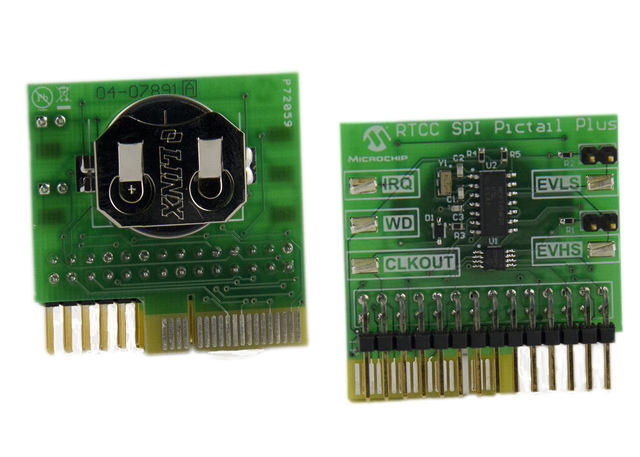 It also provides a development platform for 16-bit PIC® microcontroller-based applications, using existing 100-pin PIM systems, compatible with the Explorer 16 and other high pin count PIC device demo boards. The system comes with programmed PIC24FJ256GA110 PIM modules that communicate with the PC software for viewing data samples sent from the board. 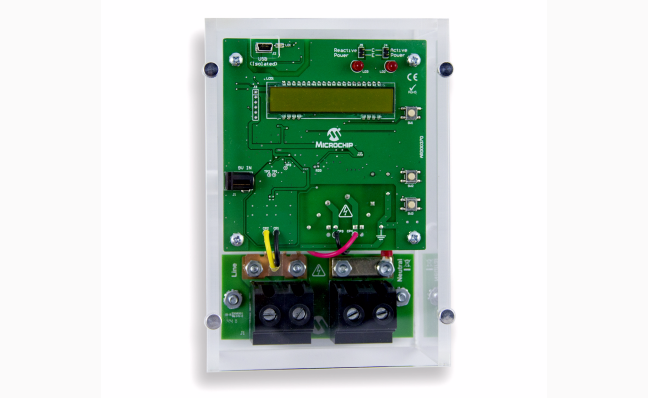 The MCP3911 and PIC18F85K90 Single-Phase Anti-Tamper Energy Meter is a fully functional single-phase meter with enhanced capabilities, such as battery backup, RTC and anti-tamper features. The two current channels are measured with the MCP3911 device and the voltage channel is measured with the 12-bit SAR ADC integrated in the microcontroller. This design has two sensors for the current measurements: a current transformer and a shunt. The PIC18F85K90 microcontroller directly drives the LCD and communicates via UART with the MCP2200, offering an isolated USB connection for meter calibration and access to the device power calculations. The system calculates active and reactive energy, active, reactive and apparent power, power factor, RMS current, RMS voltage and the line frequency. The Microchip Energy Meter Software is used to calibrate and monitor the system. 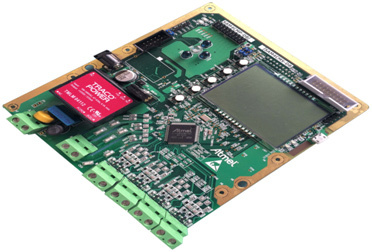 The MCP3912 ADC Evaluation Board system provides the opportunity to evaluate the performance of the MCP3912 four-channel Analog Front End (AFE). It also provides a development platform for 16-bit microcontroller-based applications, using the existing 100-pin PIC ® microcontroller Plug-in Module (PIM) systems that are compatible with Explorer 16 Evaluation Board (DM240001) and other high pin count PIC-based demo boards. The system comes with a programmed PIC24FJ256GA110 PIM module that communicates with the Energy Management Utility software for data exchange and ADC setup. This software communicates via a USB connection to the board. A download link for this software can be found below. For instructions on the use of this software, refer to the supporting documentation included within the application installation package. 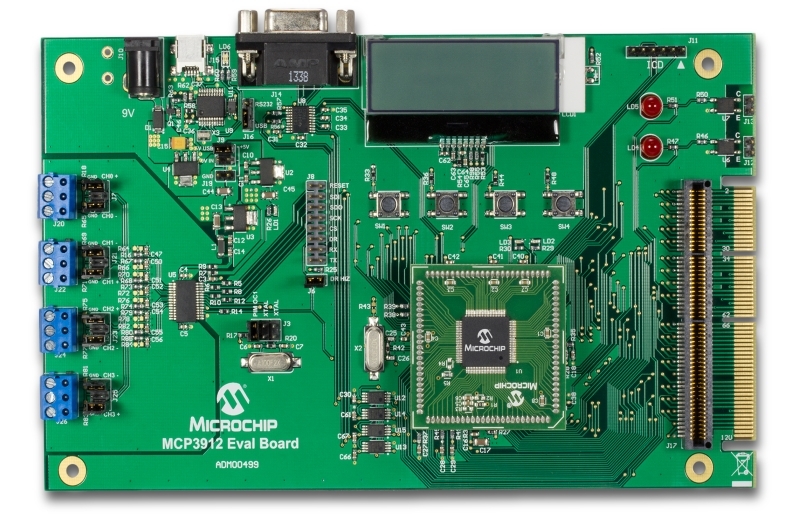 The MCP3919 ADC Evaluation Board system provides the opportunity to evaluate the performance of the MCP3919 three-channel Analog Front End (AFE). It also provides a development platform for 16-bit microcontroller-based applications, using the existing 100-pin PIC ® microcontroller Plug-in Module (PIM) systems that are compatible with the Explorer 16 Evaluation Board (DM240001) and other high pin count PIC-based demo boards. The system comes with a programmed PIC24FJ256GA110 PIM module that communicates with the Energy Management Utility software for data exchange and ADC setup. This software connects via a USB connection to the board. A download link for this software can be found below. For instructions on the use of this software, refer to the supporting documentation included within the application installation package. The MCP39F501 Power Monitor Demonstration Board is a fully functional single-phase power monitor. This low-cost design does not use any transformers and requires few external components. The device calculates active power, reactive power, RMS current, RMS voltage, power factor, line frequency and other typical power quantities as defined in the MCP39F501 data sheet. The MCP39F501 Power Monitor Utility software is used to calibrate and monitor the system, and can be used to create custom calibration setups. For some accuracy requirements, only a single point calibration may be needed. The MCP39F501 Power Monitor PICtail™ Evaluation Board duals as a fully functional single-phase power monitor and development platform. This low-cost design does not use any transformers and requires few external components. The device calculates active power, reactive power, RMS current, RMS voltage, power factor, line frequency and other typical power quantities as defined in the MCP39F501 data sheet. The MCP39F501 Power Monitor Utility software is used to calibrate and monitor the system and can be used to create custom calibration setups. For some accuracy requirements only a single point calibration may be needed. The MCP39F511 Smart Plug is a fully functional power meter capable of transmitting its data over a Bluetooth® interface to an Android phone or tablet. 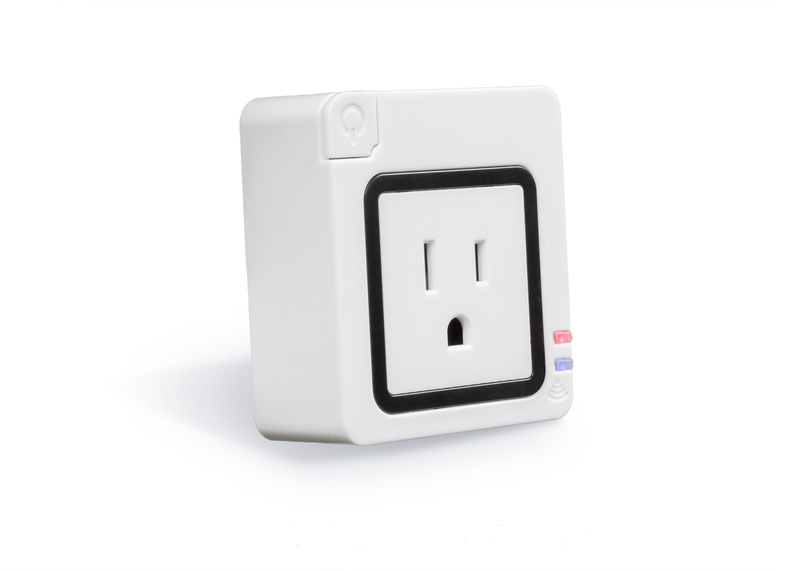 It is designed to stand between the wall outlet and any electronic device that the user wants to control and monitor remotely. The system calculates the real-time values of the RMS current, RMS voltage, frequency, active, reactive and apparent power, power factor and also the energy consumption. The MCP39F511 Smart Plug allows remote power control to save energy when the user turns an unused device off, instead of keeping it in stand-by (still consuming power). It also offers an easy way of monitoring the electrical behavior of home devices and appliances, allowing early detection of malfunctions if an over power or over current event is observed. The free Android application for the MCP39F511 Smart Plug can be found on the Google Play Store under "Microchip Smart Plug". 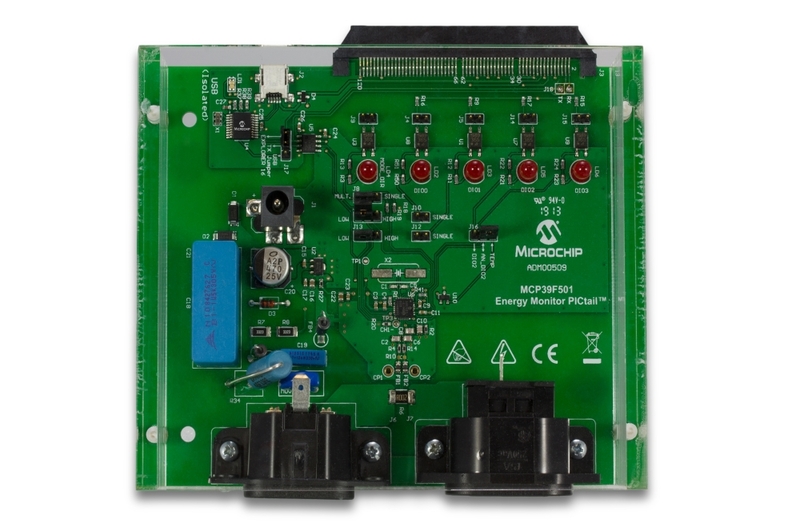 The MCP39F511N Power Monitor Demonstration Board is a fully functional dual channel single-phase power and energy monitoring system. The system calculates and displays active power, reactive power, RMS current, RMS voltage, active energy (both import and export), and four quadrant reactive energy), on 2 independent channels, simultaneously. It connects easily through USB to the “Power Monitor Utility Software” that offers automated control to allow you to easily experiment with all system configuration settings such as PWM output frequencies, zero crossing detection options, and event configurations, among many others. The “MCP39F511N Power Monitor Utility” software can also be used to and be used to create custom calibration setups. For most accuracy requirements, only a single-point calibration is needed. The energy meter software offers an automated calibration process that can be used to quickly calibrate energy meters and allow you to experiment with different calibration procedures. 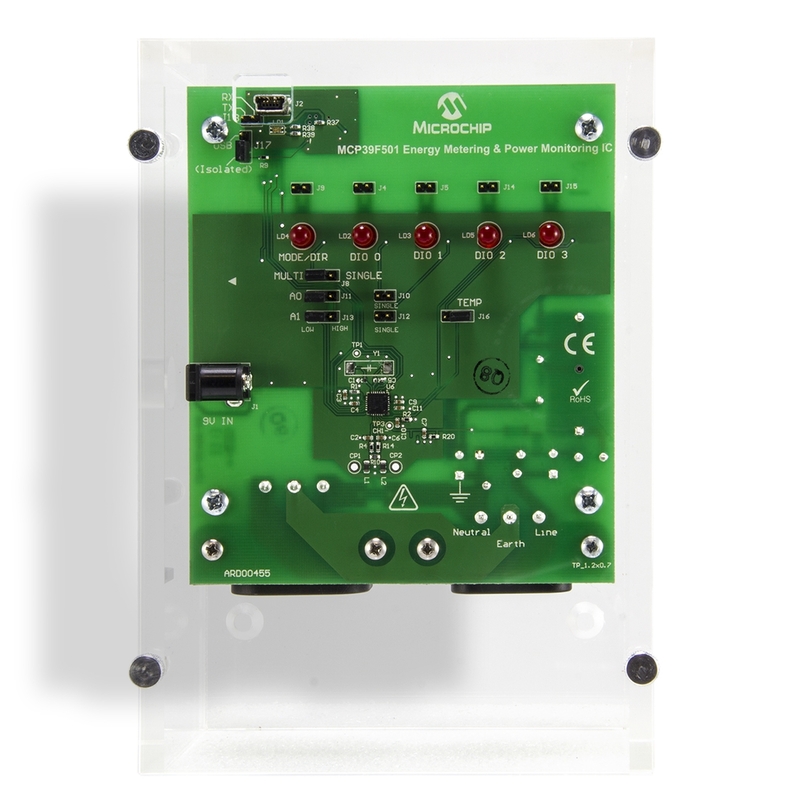 The MCP39F521 Power Monitor Demonstration Board is a fully functional I2C bus single-phase power and energy monitoring system. Up to four different devices can be placed on the same I2C bus through address select pins. The system calculates and displays active power, reactive power, RMS current, RMS voltage, active energy (both import and export), and four quadrant reactive energy. It connects easily through USB to the “Power Monitor Utility Software” that offers automated control to allow you to easily experiment with all system configuration settings such as zero crossing detection options and event configurations, among many others. The “Power Monitor Utility” software can also be used to and be used to create custom calibration setups. For most accuracy requirements, only a single-point calibration is needed. The energy meter software offers an automated calibration process that can be used to quickly calibrate energy meters and allow you to experiment with different calibration procedures. The MCP6L2 and PIC18F66J93 Energy Meter is a fully functional single-phase meter that uses the 12-bit successive approximation analog-to-digital converter (SAR ADC) integrated in the microcontroller. This low-cost design has a shunt as the current sensor. The signal from the shunt is amplified by two external operational amplifiers and applied to the input of the ADC. The PIC18F66J93 directly drives the LCD and communicates via UART with the MCP2200, offering an isolated USB connection for meter calibration and access to the device power calculations. The system calculates active and reactive energy; active, reactive and apparent power; power factor; RMS current; RMS voltage, and line frequency. The Microchip energy meter software is used to calibrate and monitor the system. The calibration can be done in closed loop or open loop. When connected to a stable source of voltage and current, the meter can do an auto-calibration by including the open loop calibration routine and formulas in the firmware. The MCP7941X RTCC PICtail™ Plus Daughter Board demonstrates the features and abilities of the MCP7941X and MCP7940X I²C™ Real-Time Clock/Calendar family in standard development platforms. By designing this daughter board with the PICtail Plus, PICtail and PICkit™ serial connectors, it will operate with the Explorer 16 Development Board, the PICDEM PIC18 Explorer Board, the XLP 16-bit Development Board and the PICkit Serial Analyzer tool. A 3V, 2032-size coin cell battery (not included) can be installed in the coin cell holder for backup power. Package contents includes the RTCC PICtail Plus Daughter Board and an Info Sheet. 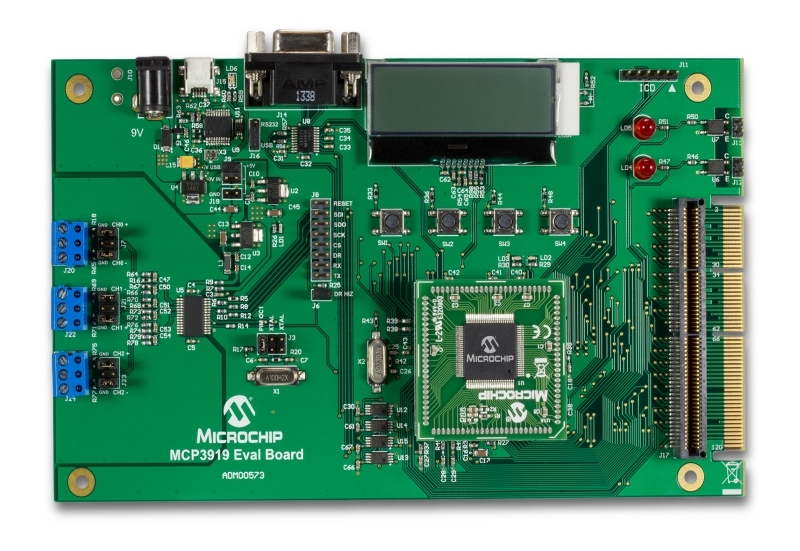 The MCP795XX PICtail™ Plus Daughter Board demonstrates the features and abilities of the MCP795XX SPI Real-Time Clock/Calendar (RTCC) family in standard development platforms. This daughter board will support the full featured 14-pin MCP795W2X and MCP795W1X devices. By designing this daughter board with both PICtail and PICtail Plus connectors, it will operate with the Explorer 16 Development Board and the PICDEM PIC18 Explorer Board. Also included is a 3V coin cell battery for backup power to the RTCC.